This image, taken from Figure 1 of the paper, shows the HST F125W and F160W exposures of SN Refsdal taken on December 11, 2015. S1-S4 show the four previous images of the supernova in an “Einstein cross” while SX indicates the location of the new image. The night sky is an ever-changing place. For thousands of years, astronomers have been trying to understand how it works. Making predictions about astronomical events offers us a chance to test our understanding of physics on a scale that is very different from the one we encounter in our daily lives. Last year, a group of astronomers had the opportunity to do just that. In a strange case of literal déjà vu, they managed to predict the reappearance of a supernova they’d already seen: SN Refsdal. This supernova, which they had originally discovered in November of 2014, was the first known multiply-imaged supernova. It was found located around an early-type galaxy in the galaxy cluster MACS J1149.5+2223. 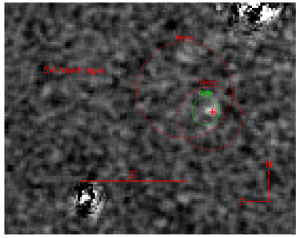 SN Refsdal’s multiple images were the result of strong gravitational lensing. Like an optical lens, a large concentration of mass can bend light. The more massive the gravitational lens is, the more it bends light from behind it. In the case of strong lensing, this can even cause us to see multiple images of a single object when rays of light that would otherwise be divergent are instead redirected towards us and appear slightly displaced from each other in the sky. While we have seen other supernovae magnified by gravitational lensing before, SN Refsdal was the first supernova that we’ve seen multiple images of. The name comes from Sjur Refsdal, the Norwegian astrophysicist who was the first to discuss the possible applications of such a discovery in cosmology. The original discovery and its significance is explained in greater detail in this earlier astrobite. Today, we’ll focus instead on one of the predictions that the original team made regarding SN Refsdal—the (re)appearance of yet another image of the supernova. Between July and late October of 2015, the galaxy cluster where SN Refsdal was located was too close to the Sun to be observed by Hubble Space Telescope (HST). However, the team guessed that Refsdal could be observed again as early as October 30, 2015, when HST would be able to look at MACS J1149.5+2223 once again. How can this be possible? In addition to appearing in different locations on the sky, the multiple images created by gravitational lensing will also experience a time delays relative to each other. This is due to the fact that the light from each image has to travel a different path before finally reaching us. The result is that the light from different images to arrives at different times. The light from this new image of Refsdal had to travel farther to get to us than the ones that we’ve already observed, so it arrived later. The HST observations of MACS J1149.5+2223 taken on December 11, 2015, show the appearance of an object that the authors interpret as a new image of SN Refsdal. This is the fifth image of the SN Refsdal that we have seen and also the first time that astronomers have ever managed to predict the appearance of a supernova! An HST image containing all five appearances can be seen in Figure 1. In this image, (also Figure 2 of the paper), the contours show the 68% (red) and 95% (blue) confidence levels on the magnification and time-delay of the fifth image, SX. The other points mark the 68% confidence levels of each of the models. The black dashed-line indicates the delay beyond which there is no light-curve data for SN Refsdal. 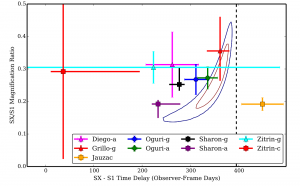 The greater the delay between S1 and SX, the earlier we currently are in SX’s light curve. In anticipation for the fifth image of the supernova, several teams of lens modelers revised their models to using the data and light curve from the previous four. These refinements were all completed before the first possible observation of fifth image of the supernova, on October 30, 2015, so they were blind predictions. Since we don’t have a perfect understanding of the distribution of the dark and baryonic matter in the galaxy cluster, each model has to makes different assumptions, leading to different predictions for the properties of the fifth image. While we don’t have enough information to attempt to use SN Refsdal for precision cosmology as Sjur Refsdal had suggested in his seminal paper, SN Refsdal is still unique in its ability to test various gravitational lens models. Unlike a supernova that is magnified but does not have multiple copies, a multiply-imaged supernova like Refsdal can be used to test not only the level of magnification a model predicts, but also the relative time delay predicted between images. A comparison of the observations with the models is shown in Figure 2. Also Figure 3 of the paper, this shows the location of the fifth image, SX, anticipated by three of the lens models (circled) as well as the actual location, indicated by a cross. While the authors are careful to note that the test is local–meaning that they cannot test how well the model fits everywhere, they maintain that it is still a good look into the uncertainties intrinsic to the models. Tests with lensed supernovae can provide magnitudes for uncertainties that are otherwise unknown. 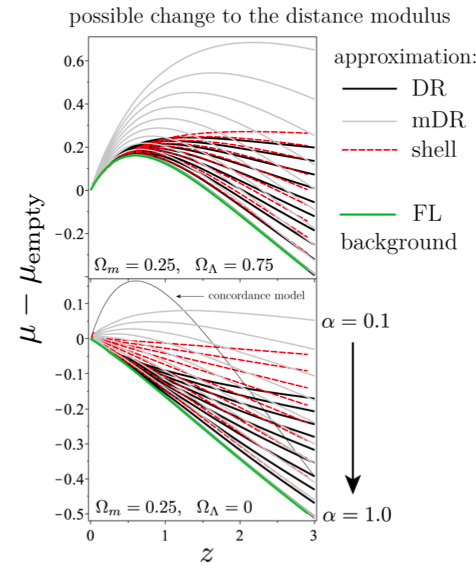 They conclude that after comparing the lens models with the new observation of SN Refsdal that unknown systematic uncertainties of some models are not larger than the random ones, which validate the assumptions in the models. Secondly, they have found that some of the lens models more closely follow the observations, but the models in general tend towards high magnifications or shorter time delays than what they observed. Figure 3, for example, shows the location of the fifth image and the prediction from two of the lens models. The authors are still waiting for the full light curve of SN Refsdal before conducting a complete analysis of the model predictions and observations. Regardless of what they find, it is certain to improve our understanding of gravitational lens modeling. Disclaimer: As stated in the previous post about SN Refsdal, I’ve worked with some of the co-authors of this paper on other projects, but I covered this one because I think it’s cool. Are supernovae really so super? Inhomogeneities and the accuracy of distance measurements The Top 12 of 2012 A long-awaited discovery How well do we measure the radii of white dwarfs?